Striata Spotlight News eBilling - What's the winning eBilling strategy? It’s what every biller wants to know: of all the eBilling strategies proposed in recent times, which works the best? At the forefront of research into this topic are a number of top analysts, including (amongst others) Gartner, Forrester and the Tower Group. The key point in question is whether customers would ultimately prefer to view and pay their eBills (1) individually, at each biller’s website, (2) all at once, through a 3rd party website or (3) all at once, through their chosen bank’s website. These three strategies are referred to as ‘Biller Direct’, ‘Portal Aggregation’ and ‘Bank Aggregation’ respectively – each of whose merits and flaws are discussed in detail below. Also examined is a fourth approach called ‘Customer Aggregation’ – a strategy that seems set to grow in the Australian eBilling market. With the inception of eBilling, the first strategy that billers adopted was to present their customers’ bills on their website. This “Biller Direct” strategy was relatively successful and is still around today. But the analysts questioned whether the “Biller Direct” model is optimal, as the customer adoption levels fell below expectations. In the quest for a better approach, a number of innovative companies saw an opportunity to collect – or “aggregate” – all the customer’s bills onto a single online portal. Customers could then simply log on and pay all their bills in a single environment. While appealing to customers for its convenience, the “Portal Aggregation” model had one flaw: customers were wary of trusting an unknown 3rd party with all their bills. The strategy was only going to work in the hands of an already trusted brand, and Australia Post is a good example of when ‘Portal Aggregation” can work. Building on its longstanding relationship with the public, Australia Post created PostBillPay – an eBilling service that still enjoys a fair amount of success today. The flaw in “Portal Aggregation” heralded the advent of “Bank Aggregation”. When Internet banking was introduced, customers began to form a trusted relationship with their banks’ websites. As these environments became familiar to them, customers became used to the flow of information and the easy payment facilities they offered. So by the time eBilling arrived, not only did a bank’s website seem a logical place to get your bills, but the banks also saw that providing a convenient bill aggregation portal would give their customers another good reason to log on. This led to the creation of BPayView, an example of why “Bank Aggregation” is proving to be a successful strategy. When Gartner last looked at these three strategies, “Portal Aggregation” was bringing up the rear – beleaguered with inherent trust issues and struggling to find a market. Gartner found “Bank Aggregation” in second place, but growing at a considerable rate. They predict that this strategy will soon overtake the popularity of the current leader. For the time being, “Biller Direct” is clearly in front. Likely reasons include its being the most familiar model, the easiest to roll out and the most secure – managed by secure internet connections, usernames and passwords. It’s also a good strategy for the biller, who can easily control and market other products and services to their ‘captive’ customers. But while “Biller Direct” and “Bank Aggregation” are both successful, Gartner predicts that neither will end up as the ideal preferred model. Gartner’s point is valid when you consider how young the eBilling market is. “Biller Direct” is convenient only while a customer still has just a handful of eBills to pay and need only visit a few websites a month. But what happens in the near future, when eBilling becomes a universal offering? The average person has 7 to 15 monthly bills to pay. When they’re expected to log onto the same number of websites, “Biller Direct” will simply become unviable. 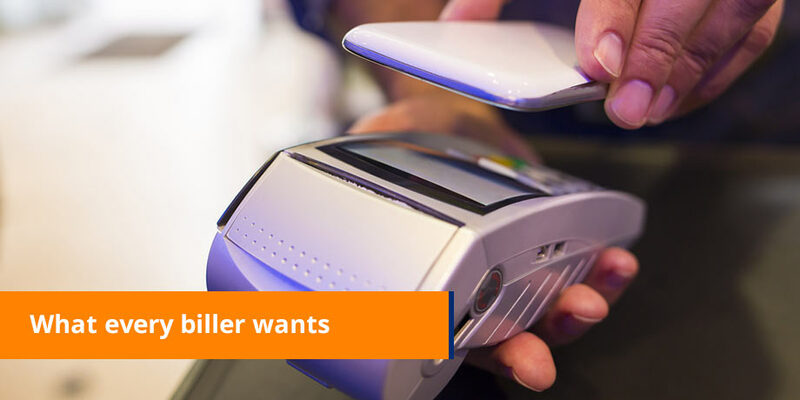 And while “Bank Aggregation” has the advantage of offering several bills at once, like “Biller Direct” it suffers from the additional problem of requiring customers to log on and fetch their bills – rather than bringing the bills to them. Which leaves the door open for a fourth strategy…one which doesn’t suffer from any of these problems. How does “Customer Aggregation” achieve all this? By presenting their eBills in the environment they use the most and feel the most comfortable with: their inbox. Email is the single largest information source for any customer, so it stands to reason that the inbox should be the portal through which they pay all of their eBills. What’s more, email allows customers to file and sort their eBills at their own leisure, in their own particular way. And with the technology now in place to enable the secure payment of eBills through email, nothing stands in the way of this strategy’s inevitable rise to supremacy. eBilling is a relatively new market – but like any technology market, innovation is driven by the customer. And what they want more than anything else is today’s busy world, is convenience. The strategy that delivers optimal convenience is the one that will dominate in the end. It seems clear that this strategy will be Customer Aggregation. It offers a convenient solution in a convenient environment: their inbox. All said, it’s the kind of strategy that’s going to hard, if not impossible, to beat.